In the early days of the Internet, I was an application developer and found a lot of enjoyment in writing VRML, ActiveX controls and Java Applets. Technology was evolving very quickly in the 1990s as we moved from early HTML with all its embossed tables, grey backgrounds and blinking text. It wasn’t long until dynamically data-driven websites and early Flash became a way to showcase web content in a new fascinating way. One new technology that is starting to gain interest in the latter part of our current decade is Augmented Reality. What is Augmented Reality? It is simply a way to blend computer graphics objects with real-life objects. It really isn’t new technology, but it is a new way to let consumers interact with your product through a web cam and free software. Bringing it to the masses is what’s new. Advertising is finding ways to integrate their products into your real-world life through the use of a web cam and PC (sorry Mac users, myself included.) How are they doing it? By letting people view images of a product on their computer screen that shares the space with their present physical world. Play some of the videos on this article to get an idea of how it works. 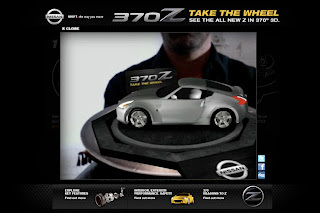 So far this is an International method of promoting a car as the UK has two examples; one from MINI and the other from BMW, while the Australian’s get to play with a paper steering wheel while viewing the new Nissan 370z. It is cool. And like anything that uses technology in a cool way, it comes across as being innovative which in turn gets consumers to see your product as innovative. The thing I really find most interesting about Augmented Reality’s use in marketing is how it gets your ad noticed in a sea of typical advertising. Provided you take the time to engage with the Augmented Reality software, you are probably going to show your friends or talk about it with your co-workers. Why, because it’s different and relatively fresh. Of the three automotive brands using the technology, the best implementation goes to BMW for their incorporation of the technology into their Z4 campaign. The Nissan and MINI demos merely showcase the car on visual plane. The Nissan has a nice touch of lighting up in a dark room, but it is still just a visual ah ha moment. The Z4 implementation actually lets you “drive” the Augmented Reality car to create a painting. Their implementation makes use of the technology in a way that relates back to their campaign and, best of all, may actually get you to try doing another painting again so you reengage with the brand many times. The one problem with Augmented Reality use by marketers is that few people will use the technology, since it has a few technical barriers; even though, most new technology innovations have audience adoption limitations. Using the technology requires taking a print ad or mailer to your computer to see the product demonstration (most also let you print out a page on your printer.) There will be few who do that or realize what the advertisement is talking about. It isn’t instant and does require downloading software and sitting at your computer screen to engage. tyne and wear campervan hire A feel to be proud after read your article. Actually its a need of human and Developing is must for us successful in life.